We compromise with this soup, and we both come out winners. I say this is the easiest soup ever because you load it with what you love and what you have on hand. You can buy ingredients, and that's fine, or you can go with what you have. Here's what's in this mix. Brown the beef with the garlic, onion, and pepper. Add the tomatoes, beans, and stock. Add other veggies and allow to cook well. Serve with grated cheese, a dollop of sour cream, or croutons. You can throw in sausage, pasta, rice, potatoes, and whatever you want to make it yours. Using prepared beef stock gives it the taste of an all-day simmer. This is doable after work and it will freeze well for meal prep days. My husband would love this! Definitely pinning! I'm so glad. :-) What I love best is that you can use whatever you have on hand. It's a winner, for sure. You can never go wrong with a loaded up veggie soup! This looks delicious! We don't eat that much meat and always look for new and delicious ways to use veggies. I will have to try this recipe. Many thanks! Wow! You should call it kitchen sink soup! It looks delicious and I can't wait to try it out. I love soup and veggies, lots and lots of veggies. That looks delicious! I've been looking for recipes that give us some added veggies and this one would be perfect. I love a loaded veggie soup! I'm always looking for new ground beef recipes. This soup looks delicious and seems like a great way to use up veggies, too! Thanks, Jessica. It is one of my favorites. I love the fire roasted tomatoes. They give it a great flavor. Thanks, Nancy. It is one of my favorites. Me too. It has to be hearty too, and the beans really help. Thanks, Hilda. It is one of my favorites. It has to be hearty too, and the beans really help. Rebranding. :-) It really is delicious. And better the next day. Thanks, Cathy. It is one of my favorites. It has to be hearty too, and the beans really help. Enjoy! Usually. My husband embraces his inner caveman, for sure. :-) This is one of my favorites. Agreed, Rebecca. It has to be hearty too, and the beans really help. Wow, this certainly is loaded! 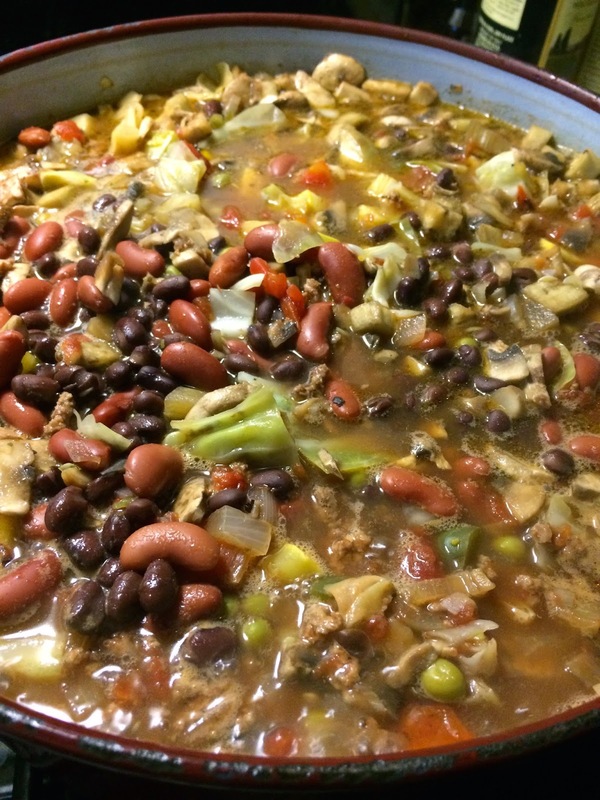 I love that this has a lot of beans in it- still a filling meal if you leave out the meat! This sounds really good. Yum! Thanks, Kerry. It is one of my favorites. I love the fire roasted tomatoes. They give it a great flavor. Thanks, Christy. It is one of my favorites. It has to be hearty too, and the beans really help. Hi Kelly, wow a loaded soup and it looks delicious! Love soups with plenty of variety! So many veggies! It's like a bowl of health! well done! i agree, veggie soup should be loaded up! Yes, please. And let me know how you change it up to make it yours. :-) Love trying new things! It's a favorite around here. We're soup and stew people, and when it's cold, it really hits the spot. It's a favorite because it's good and it's easy to use whatever is in the fridge or cabinet. It was a winner. Sure, come on by...we usually always have something on the stove. Cheers! Indeed. We don't like to waste anything, and especially food, so this is a great way to use what we have. :-) Happy Friday!